The ladies special train service was initially launched between Churchgate and Borivali station, but was later extended upto Virar in 1993. The train service to ferry only women passengers was launched on May 5, 1992. 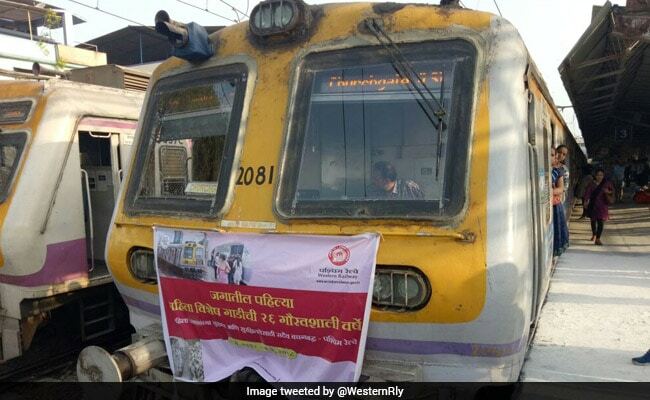 Mumbai: The Western Railway celebrated the completion of 26 years of its first 'ladies special' train today. It was on May 5, 1992 that the Western Railway introduced the train service to ferry only women passengers between Churchgate and Borivali stations. Since then , the number has now gone up from two to eight services a day- four each in the morning and evening peak hours. "Dedicating an entire train to women commuters has gone down in the annals of history and the WR has become the torch-bearer for other Railways," Western Railway chief spokesperson Ravinder Bhakar said. "It is nothing less than a milestone that dedicating an entire train exclusively for women commuters for so many years has undoubtedly helped over one million-plus Mumbai women commuters to travel safety to and from their homes and workplaces," he added. Commuters of Virar-Churchgate Special were greeted with roses by women ticket checking staff. Feedback forms were also given to women commuters for their comments/suggestions on ladies specials. The train service has seen good response from daily commuters. "Women commuters are benefitted immensely by WR's ladies special trains which is evident by all packed 12 coaches during peak hours," a daily commuter said. "Since then, the train has been serving lakhs of women commuters daily, which is now considered a milestone for any suburban transport system in the world. Running successfully for 26 years on one of the busiest suburban lines is considered a blessing by all female travellers," it added. Currently, Western Railway runs four services in the morning peak hours originating from Borivali, Bhayandar, Vasai Road and Virar stations that terminate at Churchgate and another four in the evening peak hours from Churchgate to Borivali,Bhayandar and Virar (two services) stations. Following in the footsteps of Western Railway, the Central Railway(CR) also introduced suburban services exclusively for thewomen commuters on July 1, 1992 between Chhattrapati Shivaji Maharaj Terminus (CSMT) and Kalyan. The CR runs four full and 24 partial ladies special services between CSMT and Kalyan corridor, CSMT-Panvel corridor on the Harbour line. Talking about the celebrations planned on the occasion, Mr Bhakar said, "Women commuters in the special trains will be greeted and feedback will be taken from them to further improve the train services." In a statement, he said that over the years the Western Railway had taken several initiative to "instill a sense of safety and security" amongst the women passengers by installing CCTV cameras in many ladies coaches and by introducing talk-back system.